Size: It reaches a maximum length of about 40 cm and is the largest pipefish in the Arabian Gulf. 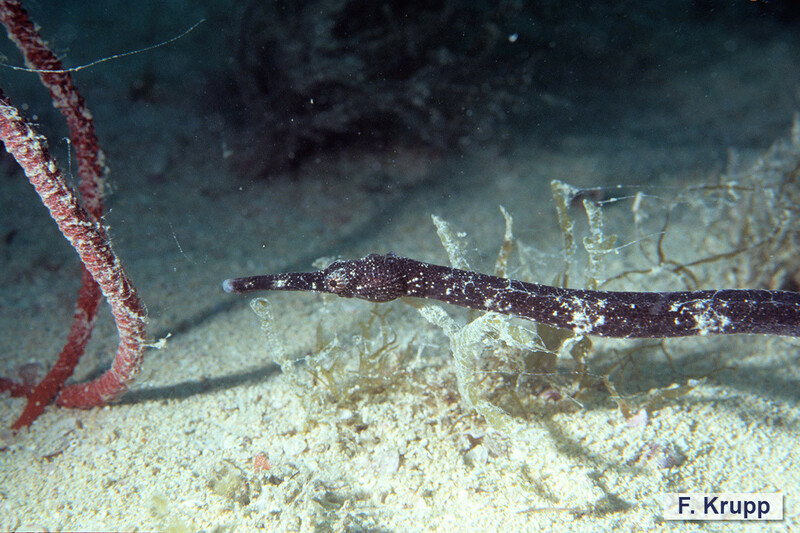 The Double-ended Pipefish inhabits soft-bottom inshore areas, is often found among algae or seagrass, and also occurs at seaward coral assemblages, from shallow water usually to depths of about 25 m. The male carries the eggs in a brood pouch under the tail and gives birth to life young. Planktonic juveniles have six pairs of long dermal appendages dorsally on the body, which keep them floating in the water column. This species is widely distributed in the tropical Indo-West Pacific from the Red Sea and East Africa to New Caledonia and Micronesia, and north to Japan. This is a large and slender pipefish, with superior trunk and tail ridges discontinuous, lateral trunk ridge confluent with inferior tail ridge, and caudal fin well-developed in young, but rudimentary or absent in adults. Its color is variable, from whitish or yellowish, to brown and nearly black, with or without pale or dark bars, and often with small pale and/or dark spots.